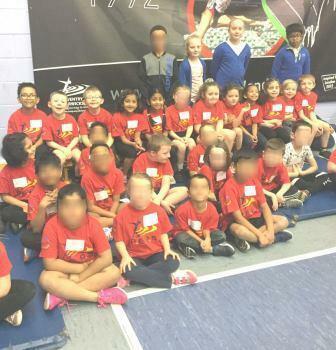 On Wednesday 30th January 2019, the whole of Year 2 travelled to the Alan Higgs Centre to take part in an agility competition against five other Coventry schools. They had a great time and joined in all the activities with enthusiasm, whilst representing Stretton brilliantly. What a great morning out! On 4th November Year 2 ventured to London on a very plush coach! The purpose of the trip was to further our knowledge about the Great Fire of London, however our learning experiences exceeded our expectations! At the Tower of London we took part in a workshop led by an historical figure...Jane Robinson. The children learnt why the fire spread so quickly and had to make decisions about the best route of escape and how to stop the fire. As always the children were wonderful ambassadors and engaged passionately with the experience. The children were fascinated about the London landmarks that we passed on route and asked interesting and thoughtful questions about them. We saw Big Ben in all its chiming glory, Westminster Abbey, the River Thames, Tower Bridge, the London Eye and the Gherkin! We were also lucky enough to see the changing of the guards at The Tower or London and were mesmerized by the Crown Jewels. The children loved the fact that they were witnessing significant events and viewing important artefacts that form part of our rich British History. I know there were many Year 2 parents who were envious of our experience! I mustn't forget to mention our trip to the gift shop where many children purchased quintessentially British items such as crowns, flags, Beefeater bears and replica Crown Jewels. I know they felt very grown up being responsible for money making decisions. Red Nose Day Friday 13th March. Year 2 took part in the school's day-long dance-a-thon by joining in with their own fun dance session in the hall. Have a look at our clip! "It reminds me of being in the sky." "Makes me think of the sunshine." "It reminds me of a colourful scarf." "The artist tried to make each one glow." Have a look at our pictures and see what you think! "I felt like I was in the middle ages." "It was fun using swords, helmets and shields." "It was fun dressing up and doing the activities." "I was excited about looking things on the 'dangerous table'." Year 2 enjoyed a fantastic day out to London at the beginning of the autumn term. All the children had a great time as well as being excellent ambassadors for our school. Here are some photos..
At the beginning of June, we enjoyed an interesting visit from an animal expert who came in to class and let us meet and touch some of his creepy-crawly and slithery friends! We were all very brave - have a look at our photos below...! On Monday 10th March there were some very peculiar goings on at Stretton! Upon arriving at school we were all met with a whole host of inter galactic clues: scorch marks on the field, police guarding crime scenes, strange messages in the classroom and slime in some very odd places. This could only mean one thing...aliens had landed at Stretton!! As well as the strange clues left behind by our visitors there was was one more slight problem...they had taken Mrs.Samra back to outer space with them! The staff and children had a stellar day investigating the clues which were left all around our school. We were helped in our investigation by our local police officer P.C. Simpson, BBC reporter Harjinder Mann and a forensic scientist, who had a particular interest in all things extra terrestrial, Brian Rudkin. Thankfully, the aliens returned a slightly slimy but unharmed Mrs.Samra (along with Reception's underpants) later on that day. A dazed and confused Mrs. Samra was able to talk about her experiences with the aliens (believed to be of the 'Alien Grey' variety) and how they so wanted to learn about school life on planet Earth. Despite being slightly scared at first, the children all enjoyed working together to try and solve the mystery. This day was the stimulus for our non fiction writing assessment. Have a look at how well we did! 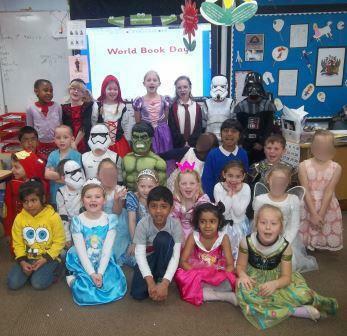 On Thursday 6th March all of the children at Stretton had a fantastic time celebrating World Book Day! Everyone (especially the adults!) enjoyed dressing up as their favourite book characters: Mr. and Mrs. Twit, the Worst Witch and the Invisible Man were all in school for the day. After taking part in a quiz in the hall, the children split into groups to work with different teachers throughout the course of the day. The children enjoyed reading a variety of books and taking part in fun learning activities linked to them. The books we enjoyed included The Twits, I Am Nit A Loser, A Cheese and Tomato Spider and Fungus the Bogeyman. Everyone loved taking part in the creative (and sometimes downright messy!) learning. Years 1 and 2 recently enjoyed a story telling visit from some very famous Coventry citizens. Have a look at our pictures below and see if you can spot Lord Leofric, Lady Godiva and Peeping Tom....! Libby Evans had written to the Queen, as she was interested to learn how Her Majesty spends her day, what life is like at Buckingham Palace and what she gets up to! Libby was delighted to receive a beautiful letter in reply, which is attached here for you to have a look at. What a wonderful treat for Libby! On Thursday afternoon 23rd May 2013, Year 2 enjoyed their first forest school session. The children learnt the rules of forest school, explored the site, identified a variety of trees, enjoyed clearing up the litter and digging in the mud pit. The children can't wait for their next session...but we suspect that Mrs. Swan could be even more excited than the children! "Oh, we do like to be beside the seaside"…. Years 1 and 2 enjoyed a super seaside day last month with a Punch and Judy show, face painting and donkey rides on the field! Year 2 spent the Spring term as intrepid explorers! We launched our theme with our pirate day full of exciting pirate activities. We have learnt about famous pirates and other explorers and written information texts about them. Through our work on maps, we discovered that the Bahamas have lots of explorer-related history, so we decided to compare the weather in the UK to the Bahamas . We became wonderful weather-watchers and have learnt how to measure weather conditions, making our very own rain gauge and anemometer. We have also become experts in reading thermometers! We finished our theme writing some wonderful adventure stories based on Julia Donaldson's book, The Snail and the Whale.